Get all the FAQs: Answers to Frequently Asked Questions. *BONUS - $350 Rehab Tool Package! Certification with Posture Practice Pkg VS Certification Only? This turnkey package includes everything in CPEP Certification, PLUS materials additional tools for marketing and conducting corporate talks and health screenings. After you register you'll have immediate online access, and tools are shipped. If enrolled in a payment plan items are stagger shipped, program coordinator will verify details. *frames, table cloth and table runner not included. Certification. When I look at any certification program, I research it very thoroughly. I don't want to invest time and money into something that won't benefit my business or clients. What appealed to me about this program was its basis in scientific research, its techniques, tools, and appeal to a broader client base. Though I am new to the program, I am enjoying it and looking forward to delving more into the Posture Practice system of teaching the exercises. Offering this type of exercise therapy could help me to work with pain management, as well as prevention. Also, very few people do corrective work in my area – I want to create a niche that no one else has found. I wanted to offer exercises that were set up in a structured, professional manner. I feel my patients will be more compliant with these exercises. I expect to see longer-lasting and better results, especially because any exercise regime that is cut down to just a couple minutes a day is very appealing. Living in a large city, people complain that they don't have the time, and it has to be easy. The simplicity of these exercises is the key. I feel that my CPEP training is ideal for the corporate setting. You have to get people moving, and show them the importance of good posture and alignment for everyday living. I love that my job helps people to feel and function better. I don't see the need for proper bio-mechanics changing anytime soon, as our society continues to round forward with excessive computer technology. Medtronic is very wellness-oriented. Their employee wellness initiatives include healthy, fresh cafeteria fare, sponsored 5K and marathon events, and free fitness classes and health coaching. Out of 3500 employees in my building alone, 1750 are currently enrolled in the fitness program. Program Manager for Medtronic Wellness Centers in the Minneapolis area. I continue to be blown away that you guys have literally created an entire niche in an already existing profession. That fundamental fact is probably easy for you to forget -- but relish in it once in a while because it really is HUGE! I just finished the required webinars. Good stuff! I also heard the one on the new iphone app and it's really cool! I sent an email thanking all of you for literally creating an entire profession of posture experts! The whole CPEP experience has been an ah-ha! moment! Upon researching posture certification programs, I found the BodyZone CPEP posture certification program. I use a gentle, holistic manual release technique to treat patients, which works seamlessly with StrongPosture principles. 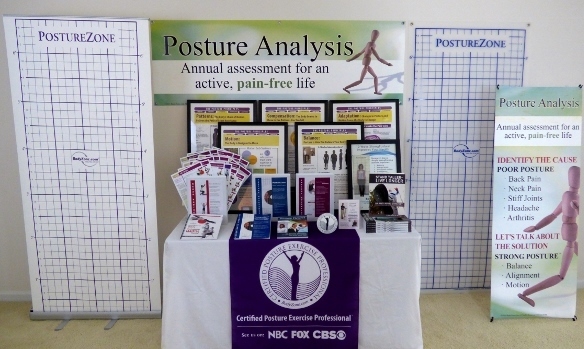 My whole brand focuses on postural assessment, which helps to determine a patients' wellness path. I take into account the patients’ entire history, including major trauma, emotional challenges, and current pain issues, and then treat with a combination of soft tissue work and StrongPosture exercises to align their bodies and keep them where they need to be to prevent further pain and injury. The CPEP posture certification program was the 'missing link.' It ties in nicely with everything I offer at my practice. The body has a unique way of healing itself if we just listen. That's what I love about the CPEP certification exercises: I am giving my patients one to two things to leave with, which means they are more apt to follow through with exercises and to retain and apply the knowledge I am providing. Every person that comes into my practice has a complaint about posture. Once they start doing the exercises, they can tell a difference in their problem areas. One young woman recently told me that she was breathing better! Overall, my patients are in less pain, they're sleeping better, feeling well, and taking the initiative to change their lifestyles. I currently work with patients largely on a one-on-one basis. However, I plan to provide CPEP StrongPosture Exercise classes for different demographics in my community, including a children's posture bootcamp, and corporate wellness workshops. This is what I love. The whole CPEP experience has been an 'ah-ha!' moment for me; it's like I am falling into exactly what I was always meant to do. I would recommend the BodyZone CPEP training to any professional serious about obtaining the absolute best results for their patients. This posture certification program offers plenty of "hands on" training that helped me feel comfortable presenting these techniques to my patients. BodyZone posture exercise has helped our clinic to achieve lasting results with our patients that we could not achieve with chiropractic spinal manipulation alone. There has been a "buzz" in our clinic since adding this posture program, and we find that patients look forward to their rehab sessions in our clinic. The successful patient experiences are countless. We teach patients how to isolate, mobilize, and strengthen the core musculature through bodyzone exercises and they feel better as their posture improves. I wanted to hold a dual certification to enhance my professional development and was searching for a professional certificate with a focus on posture, as most of my patients have postural scoliosis, and I was drawn to the online seminars and StrongPosture protocols offered by the CPEP program. It has been a great experience for me. I can complete the program with ease through online training, and the BodyZone team is so helpful. I enjoy learning the posture protocol through the exercises and the follow up sheets - I really find it so organized. We’ve never been a 'pain practice.' Ours is a subluxation, holistic-focused practice and we believe strongly in patient education. My goal is to empower every patient to control their own health. We begin by addressing all facets of health: attitude, nutrition, proper rest, posture, exercise and chiropractic. We strive to provide a level of service that separates us from other offices. We know by staying on the cutting edge, we can provide the most optimal form of health care possible. Over the years we have provided treatment through the use of Spinal manipulation, Traction, Physiotherapy modalities, Soft tissue massage therapy, Nutrition Counseling, VAXD therapy and Spinal Rehabilitation Programs. We found the most inconsistency with setting up the Rehab Program. In many cases, we found that there was a lack of both interest and accountability from our patients. This is why the CPEP certification program was right for us. It provided a foundation that is easy for our patients to understand and enjoyable for them to do! All of my team is involved with the posture exercises. The CPEP program fits right in with our practice. The information and packages provided in the Strong Posture program make it easy to use. The CPEP program and PostureZone.com provided the tools to tie together all these things we have been working toward – it has created a foundation to work with patient goals and helps us to be consistent. Our four docs and athletic trainer work together as a team. We also have another team member working toward earning CPEP Certification. The missing part of most chiro offices is posture exercise. Patients want to be active. Brand new patients often ask, 'What exercises can I do?' The challenge is having a program laid out to establish consistency and proper accountability. Now that we've committed 100% to becoming a Posture Practice, people are really excited about doing the exercises. They see benefit to improving the framework of their body and are benefiting daily from the results of the posture program. The CPEP protocols have helped us to develop a system to move patients from passive phases of pain management treatment to active phases of healthcare. Patients see that even after they are feeling better, it is essential to maintain proper posture, alignment, balance and motion. Really, really good. I enrolled in the international version of the CPEP posture certification program and am thoroughly impressed with content, methods, and applicability. Appreciate the step by step approach. The postural rehabilitation certification protocols provides a systematic step-by-step approach to postural evaluation and care. The posture training program has opened my eyes to the complex interaction between adaptive postures and motion. The training concepts have given me more productive tools in explaining the imprortance of posture, balance, and motion to my clients. Click the button below to add the CPEP Certification & Posture Practice Pkg to your wish list.